This image will stick in my mind for a long time and I hope the picture can convey some of the beauty of Hawaii’s Volcano National Park. We had spent 5 days on the big island and had driven around the park on two separate days with tour guides, once at daytime and once at night. As we stood near the caldera late at night, I wondered what the volcano looked like at dawn. We were due to leave the island early afternoon on our last day, so with no other morning activities planned I decided to get up to the volcano at dawn. I woke at 4.30am and planned to leave a 5.00am, with 10 min to go my wife decided to come and therefore my daughter was dragged out of bed as well. Consequently we left around half an hour later than planned for the 40 min trip from HILO to Kileaua. The drive was interesting, apparently my daughter is not a morning person and complained the whole way up the mountain. As we approached the top it became apparent to me that the 30 min delay meant that the sunrise opportunity had been lost, so with a disappointed outlook I turned into the park and made our way to the lookout, parked and got out of the car. As I was walking over to the viewing area I became more enthusiastic, Due to the lack of any wind the steam and mist were combining with the low sun to create a surrealistic scene. I quickly set up my tripod and started snapping away. The scene was too wide for a single shot so I set the camera up for stitching and took a series of portrait oriented photo’s with differing exposures. After getting the shots I packed up and spent 5 minutes just staring at the view. I don’t travel with a laptop so I had to wait until arriving back in Adelaide to know if the image would join effectively, the software (PTGUI) had some problems due to the nature of the shot but after adding some manual join points it all worked well. 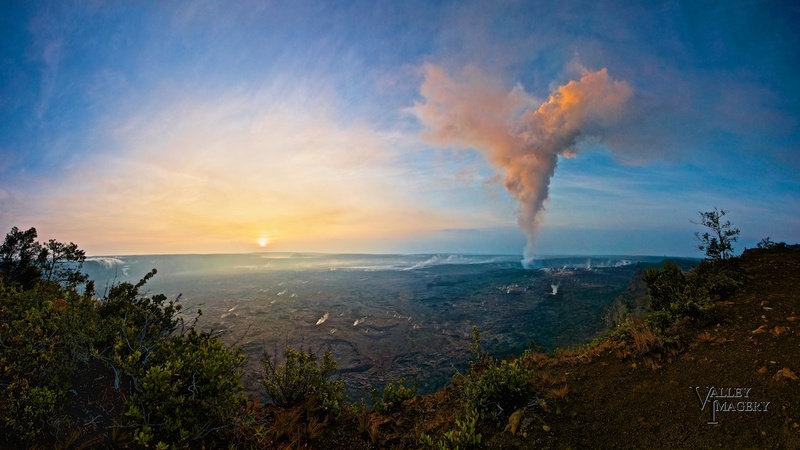 The landscape and the light combined with an active volcano on such a still morning will be difficult to forget. Even my daughter thinks it was worth the trip. This image was commended in the 2014 World photography award and will be displayed at Somerset House London in May. If you would like to see this on your wall at home, contact me to arrange pricing.